Clean by nature – made of 100% organic unhulled black sesame. Seeds are carefully stored and ground in a a stone mill. Rich in fats – of the good kind. Full of energy. A great source of plant protein. You can’t compromise when it comes to the mandatory little black dress in your wardrobe and you can’t with the little black jar of black sesame in the cupboard. 100% seeds of unhulled black sesame. Wonderful source of plant protein and good fats. The seeds are heated. Once they’re cool down, they’re ground in a stone mill until the seeds turn into a fine paste. Then it’s poured in a jar. 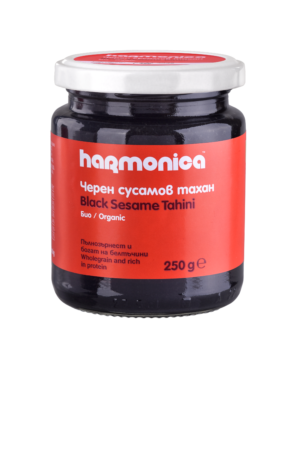 Aside from eating it directly from the jar, the black tahini is great for cooking raw desserts.